Week 43: Recovery Week – Where's The Tofu? 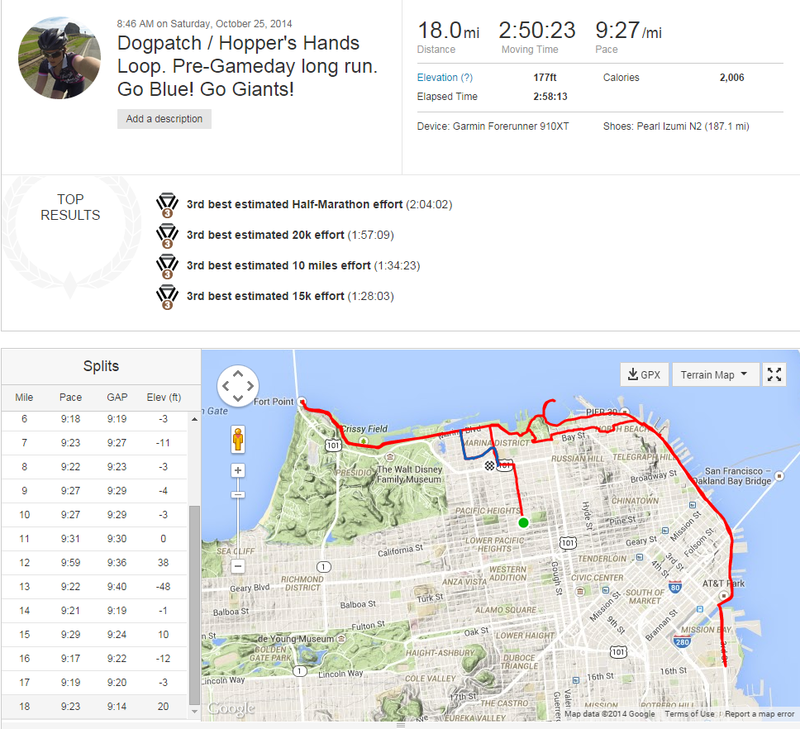 Good thing this was a recovery week because life has been a little nutty with work + SF Giants + social events. It’s a tough life 🙂 Speaking of nutty, I discovered vegan Nutella and it’s lick-the-spoon delicious. It’s the Justin’s Chocolate Hazlenut Butter. Not the healthiest, but man it’s good during a stressful week! 18 Miles: Home to Plant. There’s nothing I love more than waking up early and running around this amazing city. Whether it’s Marin County, or right out my backyard in SF, there’s so much to see and explore. The views never get boring, and I always seem to see landmarks with a new perspective when I run by. On Saturday I rolled out of bed and ran along the Embarcadero (the SF waterfront) passed the weekend Farmer’s Market, towards AT&T Park where the Giants were set to win that night, U-turn at the Dogpatch when things get a little sketch, back along the Marina with the Golden Gate Bridge in full view, and back home ending on Chestnut Street in the Marina. I purposely calculated my route so I would finish my 18 miles right at one of my favorite brunch spots, the Plant Cafe! I got the vegan basil tofu scramble and a raw cacao almond milk drink. Both were amazing!! I highly recommend this running route if you need to do a long run, but make sure to get up early to beat the tourists. What I like about this route is that there are plenty of places to refill water, it’s mostly flat, and the views are amazing. Plus, if you get hungry you can snag free samples at the Farmer’s Market as you zoom by! The run itself felt great. I kept a pretty consistent ~9:25/mi pace the entire time and didn’t have any issues. I compared this run to my last 18 miler that I did in Michigan and the times were almost identical, off by only a few seconds! That makes me happy because I know I’ve dialed-in a good marathon pace that I can sustain for the long haul. The biggest question I have is — what is my marathon pace when it’s included in an Ironman?! I just have no clue what pace to work with for the run portion in Cozumel because there are so many variables and I don’t know how my body is going to feel after the long swim and bike. I’m thinking ~11 minute miles which will include some walk breaks. But I’m not too sure yet. Sunday morning I was back in Napa doing the Silverado Trail (yes… again). My training plan called for a 4 hour ride on flat to rolling hills so that’s what I did. I ended up doing 71 miles in that time which is ~17.7mph. Mot my best effort but I’ll take it. 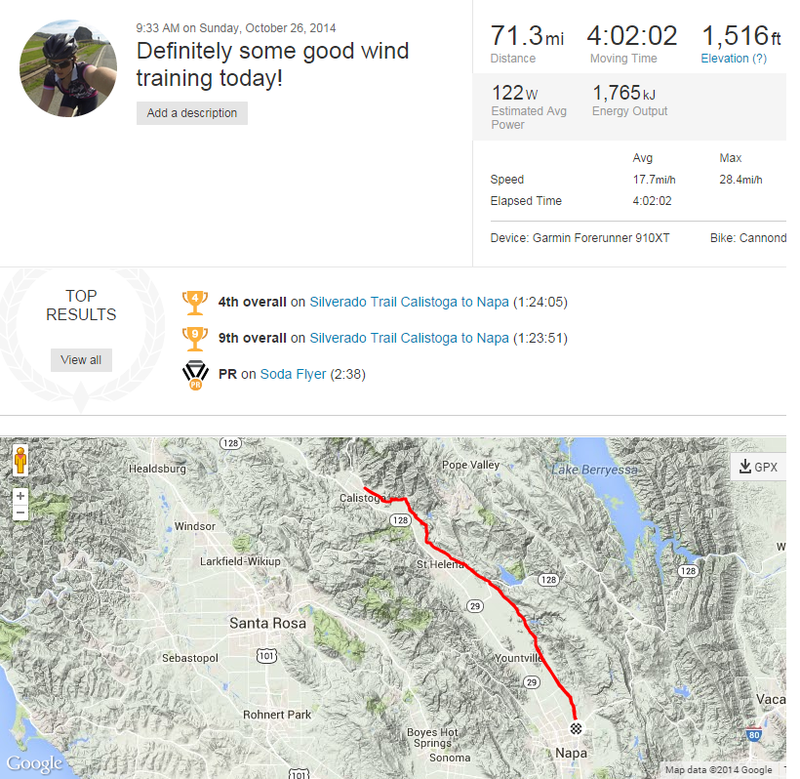 It was SO windy going North which made the first 26 miles very slow and mentally challenging. Just to put it in perspective, the first 26 miles was an average of 16.6 mph and the way back was 19.9 mph. What a difference a tailwind makes! This is amazing training for IM Cozumel because that’s exactly the type of conditions we’ll face. Although the race is a circle so we’ll have strong headwinds, crosswinds, and tailwinds. During the ride I just tried to stay in my aero bars as much as possible, eat (Shot Bloks and Picky Bars) and drink (Skratch labs and water) as much as appropriate. After the bike ride I did a short 2 mile transition run to get used to the feeling of running after biking. Then headed back home to do some work for the rest of the evening. What I really wanted to do was take a nap. Maybe next week. GO GIANTS! On Friday night we had our end of the season party for Golden Gate Tri Club, even though there’s really no ‘end’ to the club or season. 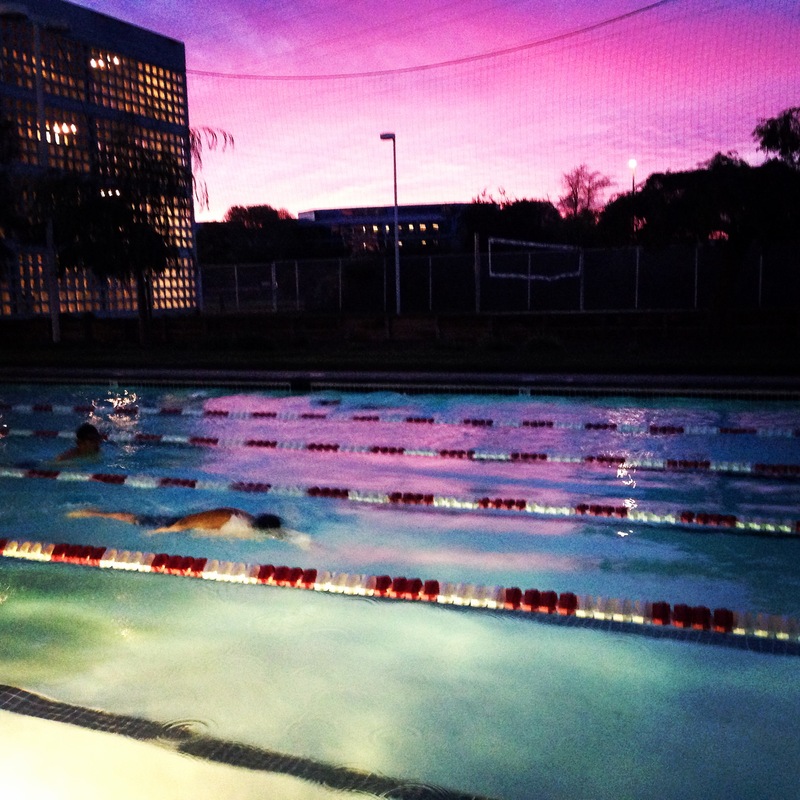 We still have workouts posted on the calendar and a lot of people are still training for Ironman Arizona, Ironman Cozumel or the North Face Challenge. Anyway, I love GGTC! So many wonderful people and I’m so happy to be a part of it. Can’t wait to see what’s in store for 2015!! Need to do more of this! Training and Racing with Whole Foods. And love that Rich Roll was quoted! Thanks Everyone. Swim. Bike Run. Eat Plants.